If you have ever been to a tropical beach you have probably noticed the odd looking trees with roots above the water. These unique plants are called mangroves. Mangroves are shrub and tree species that live along the shore of various waterbodies, primarily in tropical and subtropical regions. These plants are extremely tough, they are able to grow in conditions that most plants are unable to survive. Most of them live in muddy soil, but some grow on coral rock, sand, peat and rock. All of them grow in areas with low-oxygen soil. Due to their habitat they are subject to ocean storms and hurricanes. They also are able to live in water that is up to 100 time saltier than what other plants are able to tolerate. Even further demonstrating their toughness, they are able to survive ocean flooding up to twice a day! Most trees would drown in this situation, but mangroves are able to survive. There are over 80 known species of mangroves, and 60 of them live exclusively on coasts between the high and low tide zone. The highest diversity of mangroves was once in Southeast Asia (“What’s a Mangrove?”). Within a mangrove forest, different species occupy different niches (a niche refers to the place or function of a given organism within its ecosystem). For example some mangroves are able to better handle being covered with saltwater, these live in the open seas. Other mangroves are better suited to live near riverbanks, and some are adapted to saltier more dry soil live by the shoreline. After reading this one may wonder how mangroves can survive in these conditions-this survival can be attributed to their unique environmental adaptations. They are able to deal with saltwater by extracting freshwater from their surrounding saltwater. They filter out seawater as it enters their roots, and some excrete salt through the glands in their leaves or bark. This causes for these mangroves to sometimes have a layer of brine on their leaves. Other mangroves will concentrate the salt in older leaves or bark, so when these leaves fall they also are able to release the salt (“What’s a Mangrove”). Mangroves also have the ability to store freshwater, much like desert pants. Mangroves have thick leaves, many of which have a waxy coating, which is able to seal in water and limit evaporation. Other species have small hairs covering their leaves designed to shield against wind and sunlight. Shielding against the elements reduces the amount of water that is lost through the microscopic openings in the leaves used for photosynthesis (Kathiresan,2012). Some mangroves even have these small openings below the surface, to limit drying from the elements (Kathiresan, 2012). One of the Mangrove plants most visible environmental adaptation is their roots. 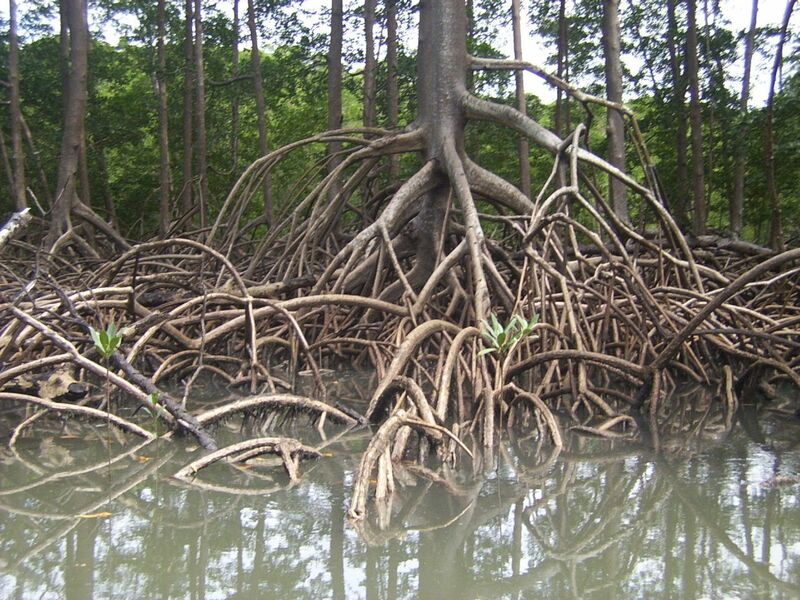 Mangroves often have root systems that arch over the water, these are called aerial roots. Aerial roots broaden the base of the tree which stabilizes the root system in the soft soil below. These aerial roots also help with respiration. Mangroves get oxygen through lenticels, which are cell-sized breathing pores in the barks and roots. Lenticels close during high tide, which prevents mangroves from drowning during high tide or when otherwise submerged in water. Many species also often have Pneumatophores, which are roots that stick out of the ground like snorkels. Pneumatophores take in oxygen, as long as they are no clogged or submerged for extended periods (Kathiresan, 2012). Lastly, mangroves have a unique way of reproducing, the seed pods germinate while on the tree, so they are ready to root when they drop. This allows for the seed to root immediately if it falls during low tide. If the seed falls during high tide it can float until it finds solid ground. These seeds may grow up to two feet in one year, and will grow arching roots to anchor the seed to the ground (“What’s a Mangrove?”). Mangroves are incredibly important parts of the ecosystem, and it is important to take the steps necesarry to conserve Mangrove forests. This can be done by donating to Enhance a Village! Your donation can help to save Mangrove forests, and help conservation efforts worldwide.